Reports of people catching Roanoke Bass or often called "Red Eye" started popping up. I thought it was a little too soon in the year to start seeing them. Then I saw a report with pictures. This was enough incentive to get me out to the river this morning. The water was higher than normal but running clear. My gut told me to go with a crawfish pattern. I tried that for awhile and I didn't get much action. As I moved downstream I found some deep holes lined with rocks. I just knew there had to be a Roanoke here. I worked the water and had a few hits. I noticed some fish right in front of me so I cast just beyond them and watched as my fly was hit about 10 times before going near the bottom. I cast out again to watch the fish behavior. As I was letting my fly dive it was hit instantly. 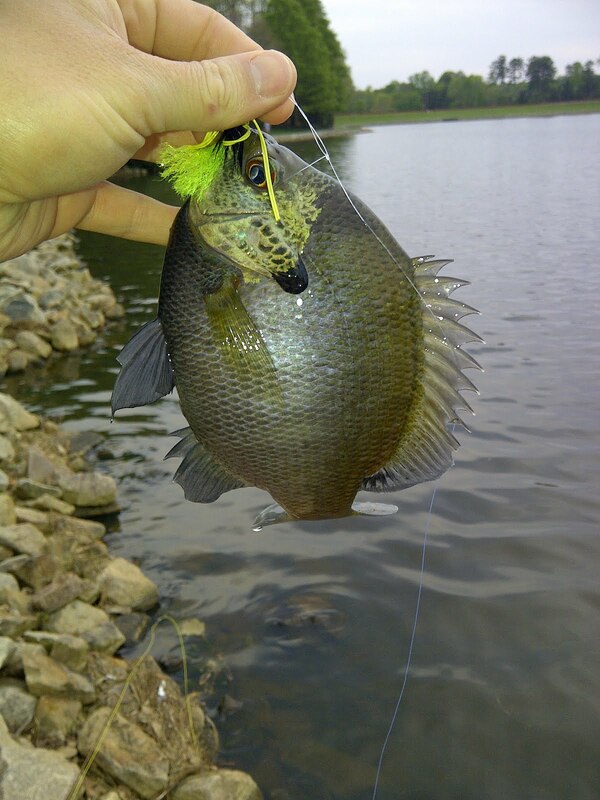 The fish wasn't big but it didn't have the orange hue that gives a sunfish away. When the fish came out of the water I knew right away it was a red eye. A fish with red eyes sounds spooky. You can see from this fish the ruby red eyes are beautiful. I have a real fondness for these fish. I guess because they are so difficult to catch. Especially a good size one. I worked the rocks some more and I noticed I would have more action from fish if I did nothing at all. Just let the fly dive down to the bottom. When you think about it that is the least threatening behavior of prey. I cast near a rock and let the fly dive down right in front of it. I saw a gaping mouth come up from under the fly and inhale it. When the fish turned I could tell instantly it was a Roanoke and the biggest I've hooked yet. I was fishing off a log jam and had to work the fish around some limbs. The fish was only 8inches but a trophy in my eyes. I look forward to hunting these guys in the future. Friday's like this are always good. There's a secret spot I always fish every time I'm in Boone. There isn't a lot of fish and you have to work for everything you catch. 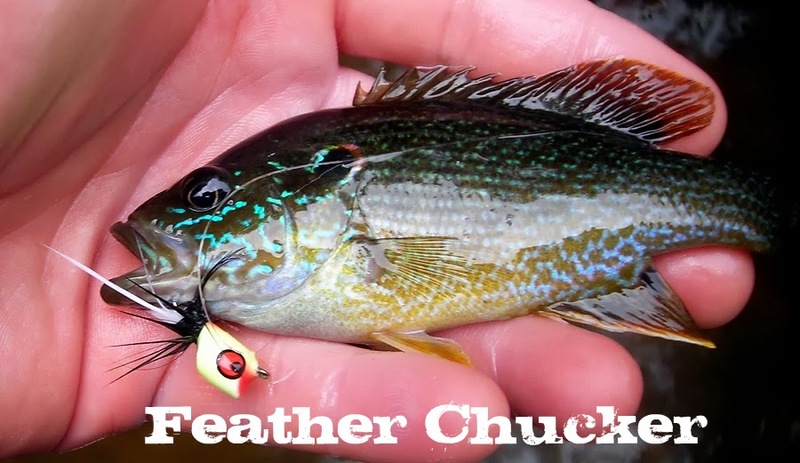 The fish that are there are wild and a 10inch fish fights harder than an 18inch stocker. I have yet to catch a fish that didn't jump the instant it was hooked. It's a place I appreciate and hold dear. I'm not sure about other fisherman but when I have a horrible day on the water I have to do another trip to wipe it off the books. Saturday was an abysmal day on the water. A thunderstorm hit the night before leaving the river muddy and high. It was the highest I had ever seen it. I was leading a fishing trip and I tried to make the best of it. Too say it was rough is an understatement. To top it off I had a friend drive an hour just to be there. I was going to try teach him how to fly fish and maybe get him on a white bass. The river conditions were too dangerous. Basically he stood on the banks and watched me fish. He was a good sport about the whole thing but I felt bad. The water was so dark and high I figured the fish were deep and hunkered down. I managed a couple fish but I had to really work at it. I almost went to another fishing spot right after just to get this one out of my mind. I needed to get home to put in some family time. Sunday we went to the NC Zoo. There was a new Dinosaur Exhibit that I wanted to check out. I have always been fascinated by dinosaurs. I can still remember as a kid watching the movie Baby: Secret of the Lost Legend. I was always into dinosaur books and finding fossils in the California desert. Even now I enjoy watching the Jurassic Park movies. My daughter has recently been talking about dinosaurs a lot and I was hoping she would be really into them. I was a little afraid these dinosaurs might scare her. They were animatronic and made noises. They also moved a little and provided a special surprise for myself. As we walked through the entrance I could hear the dinosaur sounds in the background. I kept watching my daughters reaction and she did the opposite of what I expected. She ran towards the first dinosaur she saw. I knew right away she was going to enjoy this. She had a blast and it was fun to watch her get excited when there was a new creature around each turn. The detail on the dinosaurs is amazing. I imagine a lot of work went into making them. The movements were pretty good too. They didn't have the robotic lifeless movement I've seen in the past. My son didn't know what to make of every thing. I think he was just going with the flow and watched his sister. There is a kids show called Dino Dan that my daughter used to watch all the time. I think that is the only reason she knew what a T-Rex was right when she saw it. It was probably my favorite one and really gave you the feeling of how scary it must have been to be chased by this guy. While we were walking by one dinosaur we all felt a strange sensation. It was like someone shot water at us. I realized it was one of the robots on the side but while I was checking it out I felt water hit me in the back like a kid was behind me with a super soaker. This guy nailed me. Luckily I took the brunt of the water so none go on my family. It was pretty funny though my back was drenched. The water scared the kids but it didn't take long for them to forget about it. This was an awesome exhibit and I'm sure we'll check it out again before it leaves the zoo. I was still a little bitter about the fishing experience yesterday. I wanted to get out some where even if it was a local lake. I knew my wife wasn't going to be happy about me asking. I decided to give it a try any way and she gave me the go ahead. I hurried to a local lake that I usually fish in the summer. I figured with the warm weather we've been having maybe the fish will turn on early. The water conditions were perfect. I started around a small island. I noticed a swirl and cast right for it. Instantly I had a small bass on. This lake always seems to have fish with in 8ft of shore. It's almost useless to cast straight out. All of my success has come casting parallel to shore. The closer to the bank the better. This day was no different. There are drainage pipes that usually always hold a bass. I put on a popper and worked the edges. After a couple of casts I had a fish on. Most of the bass are like this. 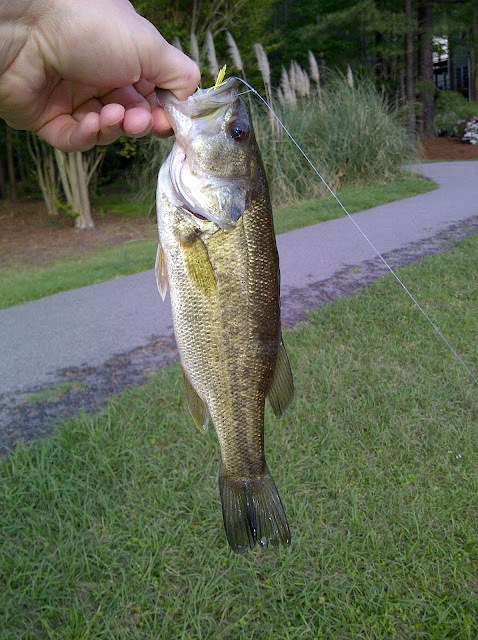 They are small and skinny but fun to catch. There seemed to be bass every few feet. The hard part was they hit so close to shore it was hard to get a decent hook set. I had tons of fish stay on for maybe 10seconds and come off a foot from shore. Honestly I kind of like that. It's like the perfect release. I get to fight the fish and feel what it had to offer and then it's gone with out much stress. The panfish weren't about to let the bass have all the fun. They were out in full force too. The gills were enormous. You can't tell from the picture but this fish is very large. I tried to take another pic with my hand behind the gill and you could not see my hand at all. The fish flopped off literally as I was snapping the picture. I caught a red breast the same size and it came off as I grabbed the hook. I'm going back another day and seeing if I can possible get one over a pound. Today I was targeting bass and I caught so many that I almost didn't even bother going further than half way around the lake. It was the kind of day you dream about. You'd see a swirl or disturbance in the water throw your popper and have something hit it instantly or with in 30 seconds. It was ridiculous. Definitely one of my best days ever fishing this lake. I guess it takes a horrible day like the one I had before to make me appreciate this one.